The Optoelectronics Company is offering two single transverse mode 639nm laser diodes with built-in photodiode, from USHIO Opto Semiconductors, for optical output power monitoring in industrial applications – the HL63391DG and HL63392DG. 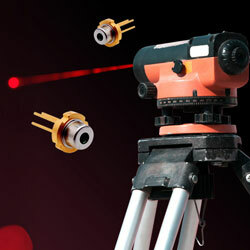 Combining an output power of 200mW with 12% lower energy consumption, these new red laser diodes provide exceptional directivity and narrow monochromaticity as well as their small 5.6mm package. They are ideal as light sources for a mixture of optical applications such as laser levelling, distance measuring, position sensing and numerous medical applications. The devices consume 12% less power than equivalent conventional USHIO diodes due to an optimised laser structure, active layers and facet coating.